Fire, in Minecraft and real life, is both helpful and dangerous. Fire cannot be obtained and stored as an item in the game, but players do have the ability to start a fire if they have the right materials. It can also be generated naturally in the game and can exist in the Nether, can be spawned if lava touches flammable blocks, or can even spawn by lightning strikes! Fire provides light, cooks meat, ignites TNT, and causes damage to mobs. But it can also cause damage to players, burn their belongings and farms, and damage passive mobs. If a player is exposed to fire, it will cause a slight obstruction of your view and will cause you to lose health at a rate of a half of heart per second. Fire damage can be mitigated if put out with water or rain. Learning how to use fire correctly is vital as you advance through the game. Take down a wooden structure such as a roof. Cook animals for food without a furnace. Create a barrier between a player and a mob. Light netherrack in the Nether. Damage enemy players or mobs. Light TNT blocks for larger explosions. Now that you know why fire can be beneficial for you as a player, it’s important to understand how to make fire in Minecraft. There are three methods in which you can both make and use fire in the game: flint and steel, fire charges, and crafting TNT blocks (that cause fire explosions). 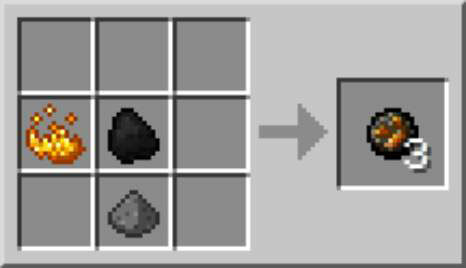 As with Survival mode in real life, the combination of flint and steel is the most common way to create fire in Minecraft. You can also use flint and steel to break blocks by left-clicking or to place fire by right-clicking. It also ignites TNT by right-clicking and can even detonate creepers. Flint and steel is more commonly crafted during midgame play, when a player has mined iron. After that point, its ingredients are usually fairly abundant. It can also be enchanted. The texture is iron in the shape of the letter C on top and a deformed flint texture at the bottom. 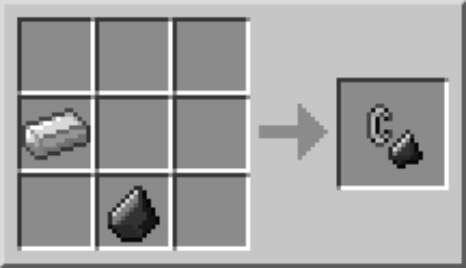 Flint and steel is a shapeless crafting recipe. To craft flint and steel in Minecraft, place an iron ingot and a piece of flint in the crafting grid. Remember, it doesn’t matter which slots you place either of these two ingredients! To place fire correctly with flint and steel, you must right-click on top of a solid, fully opaque block or on the sides of a flammable block. Though flint and steel has unlimited durability when breaking blocks, it lasts through 65 right-click fire placements, even if the fire placement is done incorrectly. A fire charge functions like a single use flint and steel because the fire charge is consumed when used (like a used match). The fire charge can be shot from a dispenser, causing 5 points (2 1/2 hearts) of damage to a player. Though a fire charge causes fire, it doesn’t cause an explosion. The fire charge looks like a circular piece of coal that is glowing. You can get all the ingredients from the Nether, which is rather appropriate because, when fired from a dispenser, it looks like a blaze or ghast fireball. Consequently, the fire charge can be used to light a nether portal. The recipe for a fire charge is shapeless. To craft a fire charge in Minecraft, you need blaze powder, gunpowder, and coal or charcoal. Place these three ingredients anywhere in your crafting grid and you will receive a total of 3 fire charges! TNT is the only explosive block in the game. Lighting it on fire, by using flint and steel sets it off. It toggles between a white texture and the normal texture; after the white texture appears eight times, the TNT expands quickly and explodes. The explosion appears random but is determined by a complicated mathematical formula that’s buried in the game’s code. Encasing TNT in stone blows up an exact 3-x-3 area. TNT, which is often used to blow up large amounts of space, can be lit by other explosions and blows up a couple of seconds afterward. TNT, once lit or activated, becomes an entity and can pass through other entities, though not solid blocks. It also responds to physics and will fall. A massive TNT explosion from multiple TNT blocks has the ability to crash a server (so be respectful when you’re using other people’s servers). Players can shield themselves from an explosion by hiding behind obsidian, bedrock, liquids (water or lava, for example), anvils, enchantment tables, ender chests, command blocks, and the end portal frame. Also, hiding in a minecart protects a player (or mob) from most of the damage. TNT is a critical ingredient in a TNT cannon or arrow cannon, or to rocket-jump (when a player is a human cannonball requiring enchanted armor to survive). In addition to the sheer fun of blowing things up, TNT is an effective mining tool to blast away large areas. TNT is also interactive with redstone and can be used to create traps, including land mines. The texture of TNT looks like a bunch of dynamite tied together by a white ribbon with the word TNT in the middle. At the top is a bunch of wicks. 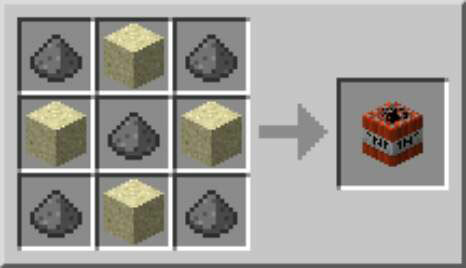 To craft TNT, you need the following ingredients: 4 sand (either red or regular) and 5 gunpowder. Place the gunpowder in the four corners and in the middle, and then place the sand in the remaining squares to create a checkered pattern. This recipe does require the exact placement of ingredients as seen below for a successful crafting process. Now you can harness the full power of fire and explosions in Minecraft to more effectively clear areas, damage players, and create fun experiences!